Coffee has been here for a while. Some of you consume a good number cups per day, while others have it in moderation. Doctors recommend taking moderate amounts as too much of it has its side effects too. To make sure that you preserve its health benefits, avoid adding sugar or generally anything that will interfere with its taste. Cold or warm, one cup or three cups, however you take it, coffee does have its health benefits and here are just some of them. Yes, it is true! Coffee lowers the risk of prostate cancer in men and endometrial cancer in women. How often? For men, consume at least six or more cups a day and reduce the risk by 20 percent. For the women, more than four cups of coffee a day will do just fine. Most of you love coffee in the morning because of its effect on your productivity. There is more to it than that as it helps reduce risk of dementia, Alzheimer's, as well as Parkinson's disease, which are all conditions affecting the brain. Coffee has antioxidants that prevent damage to brain cells and boost the effects of cells involved in cognitive function. It has also been proven to activate a DNA-repairing protein in cells which means it prevents DNA damage that can lead to cells becoming cancerous. 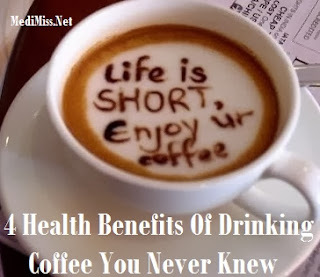 Looking at most commercial fat burning supplements, you will always find coffee present and there is a good reason for that. Caffeine is known to raise your metabolism and increases the oxidation of fatty acids. It can also improve athletic performance by mobilizing fatty acids from the fat tissues, which are used for various mechanisms. With a higher metabolic rate, your body will definitely lose a few extra pounds and with a lighter body, your overall physical performance is increased. The liver is an extraordinary organ, carrying hundreds of vital functions in the body. It is very defenseless to insults such as excess consumption of alcohol, smoking and fructose, which are known to destroy it. These habits cause severe conditions such as Cirrhosis, known to permanently damage the liver since the liver tissue has been largely replaced by scar tissue. Studies have shown that coffee can lower the risk of cirrhosis by as much as 80% and lower the risk of liver cancer at the same time. So do not feel guilty for having your coffee subscription next time they deliver some to you!